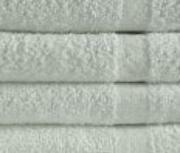 Description: Blended White Bath Towels in Large Size made of Ring Spun Cotton Yarn. DOUBLE STITCHED at hems for long laundry life. 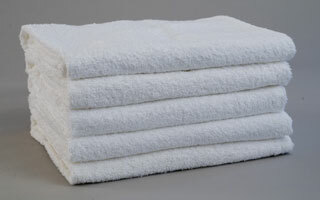 A nice premium towel to have for motels, hotels, resorts, gyms, athletic centers etc. Available at a great price! 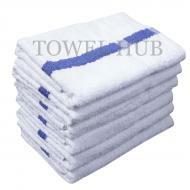 Description: Bulk White Gym / Bath Towel with a Gold Center Stripe running along the length of the towel. Used widely by gyms and athletic places. DOUBLE STITCHED at hems for durability during repeated laundry washes. Great for commercial usage. Low price!!! Description: Wholesale Blue Center Stripe Gym / Bath Towel. Perfect to use at Gyms, Workout places, Locker rooms, Pools, Hotels, Motels and anywhere that you need a medium size bath towel with a blue stripe in it. Great wholesale price offer here!! !